Only a week earlier, the capital of Asturias, Gijón, has joint the BDS movement (2). The parties PSOE, XSP and IU had submitted a proposal for a bill to the local government on January 13, in which they exposed the injustice the Palestinian people are struggling against and condemned the breaches of international law perpetrated by Israel as the settlements keep expanding in the Occupied Palestinian Territories (OPT). The justification to the bill also condemns Israeli apartheid and Israel’s denial to recognize the refugees’ right to return. It demands the recognition of the State of Palestine and the prohibition to do business with actors that violate International Human Rights Law. 6. Promote cooperation with the BDS (Boycott, Divestments and Sanctions) movement, articulated at state level by the “Red Solidaria contra la Ocupación de Palestina” and locally/autonomously by the “Comité de Solidaridad con la Causa Árabe”. 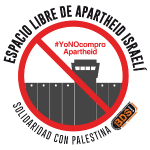 This wave of support for BDS among cities across the Spanish state is based on the ‘Israeli Apartheid Free Zones’ (ELAI, in Spanish) campaign created during the 2014 campaign ‘#YoNoComproApartheid’ (I don´t purchase apartheid), ten years after the 2004 Advisory Opinion of the International Court of Justice on the Wall. The ELAI ‘support the creation, in our neighborhoods, towns and cities, of commercial, cultural, political, sporting, academic and social spaces of the Spanish state, who refuse to collaborate with, or passively support, the Israeli colonial and apartheid system’. The campaign aims to ‘create islands of political awareness and to consolidate Spaces Free of Israeli Apartheid in different parts of the Spanish State’. The measures implemented might include declaring the Israeli ambassador in Spain “persona non grata”, as it has happened in Seville and Gilena, for example. BDS is also growing in Catalunya, as 9 local councils approved motions of support for BDS. Even though some Spanish municipalities haven´t joined BDS, they have condemned the Gaza bombings in 2014, the Wall and the International Law breaches perpetrated by Israel. To see the map of Apartheid Free Spaces, click here. Also in 2014, the International Year of Solidarity with the Palestinian People, the Andalusian Fund of Municipalities for International Solidarity (FAMSI), the global network ‘United Cities and Local Authorities (UCLG)’, the government of Andalusia, the UN Committee on the Exercise of the Inalienable Rights of the Palestinian People (CEIRPP), held the International Conference of Local Governments and Civil Society Organizations in support of Palestinian Rights in Seville. The final conclusions, summarized in the Olive Declaration (3), reaffirmed the inalienable rights of the Palestinian people and called on ‘local governments to commit to responsible investment by not contracting with parties and not twinning with cities that support or benefit from occupation or violate related prohibitions under international law’. In the Spanish state there is a growing trend to work the local spaces at all levels to ensure an ever growing territory within the state is cleared from complicity with Israeli apartheid. The BDS global campaign was created in 2005 by the Palestinian civil society against Israel until the latter complies with International Law and the Palestinian rights. Israel denies Palestinians to have their fundamental rights of freedom, equality and self-determination and promotes ethnic cleansing, colonization, racial discrimination and military occupation. Despite the condemnations by the UN and other International bodies, Israel continues to breach international law and human rights as the world community has failed to hold it accountable and to enforce compliance with basic principles of law. In order to implement the Palestinian rights, people all around the world are called to launch broad boycotts, establish divestment initiatives and to demand sanctions against Israel. BDS is rights-based and focuses on three broad sections of the Palestinian people: the refugees, those under military occupation in the West Bank and the Gaza Strip and the Palestinians in Israel.